Texas women gathered, dressed as characters from The Handmaid's Tale, to protest anti-abortion measures. The upcoming Hulu adaptation of The Handmaid’s Tale. Another day in Trump’s America, another inch toward dystopian fiction. On Monday, a group of Texas women pointedly dressed as characters from Margaret Atwood’s The Handmaid’s Tale, donning red robes and white bonnet hats, in protest of various anti-abortion measures being considered by the state Senate. Atwood’s seminal 1985 novel explored the subjugation of women in a near-future ruled by a totalitarian theocracy, which instituted an outright ban on abortion. Sales of the book have skyrocketed since Donald Trump’s election as president. The women sat patiently in the Senate chambers and held opposition signs in the halls of the Texas State Capitol. The specific measures that sparked the protest included SB 415, which would effectively ban any safe and common operations for abortions in the second trimester, and SB 25, which would allow doctors to lie to pregnant women considering an abortion if they detect any anomalies. It’s just the latest instance of high-profile organization among women rejecting Republican policies, following the massive, global Women’s March and the demonstration of white resistance at President Trump’s joint address to Congress. 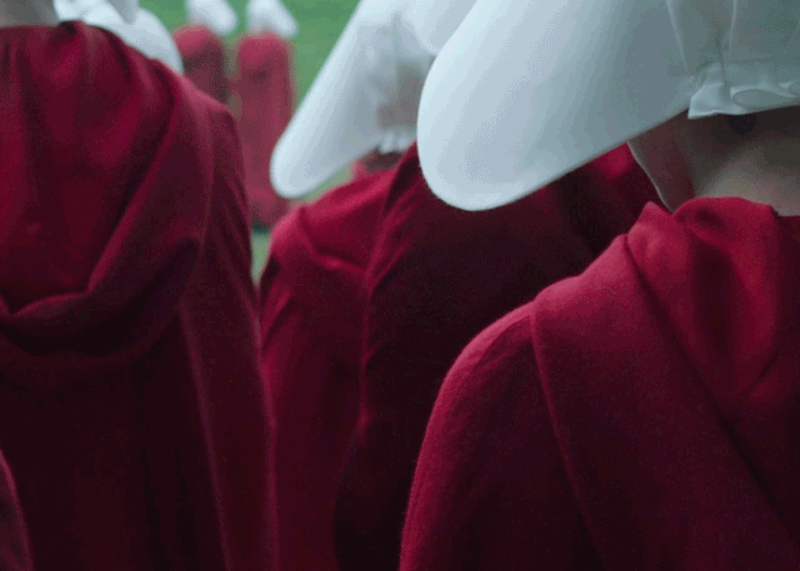 And it’s well-timed free publicity for Hulu as well: The streaming service has a high-profile adaptation of The Handmaid’s Tale slated to debut on April 26—and by the day, it’s looking more relevant than anybody could’ve reasonably feared.